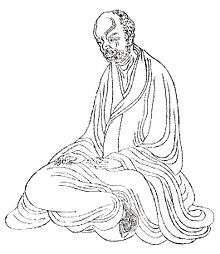 Huiyuan (Chinese: 慧遠; Wade–Giles: Hui-yüan; 334–416 AD) was a Chinese Buddhist teacher who founded Donglin Temple on Mount Lushan in Jiangxi province and wrote the text On Why Monks Do Not Bow Down Before Kings in 404 AD. He was born in Shanxi province but after a long life of Buddhist teaching he wound up in Hubei province, where he died in 416. Although he was born in the north, he moved south to live within the bounds of the Eastern Jin Dynasty. Huiyuan was posthumously named First Patriarch of the Pure Land School of Buddhism. His disciples included Huiguan (慧觀), Sengji (僧濟), and Faan (法安). "The Three Laughers of Tiger Ravine" – Huiyuan, Tao Yuanming, and Lu Xiujing – Soga Shōhaku (1730-1781). Huiyuan began studying the Zhuangzi and Laozi at a young age, as well as the teachings of Confucius. However, at the age of 21 he was converted in Hebei Province by the Buddhist Dao An, who was a Chinese disciple of a Kuchan missionary. Hearing the sermons of Dao An convinced Huiyuan to "leave the family" and embark on a life of Buddhist teachings. Later, he became a patriarch of Donglin Temple (East Forest Temple) at Mount Lushan. His teachings were various, including the vinaya (戒律), meditation (禪法), abhidharma and Prajna or wisdom. Although Huiyuan did not take the initiative in establishing the relations with the secular world, he had contacts with court and gentry families. Huiyuan was on two occasions invited by the dictator Huan Xuan to take part in the discussions about the status of the clergy and Huiyuan defended the independence of the clergy. Members of the cultured classes came to live on Mount Lu as Huiyuan's lay disciples to take part in the religious life. Besides his teaching and interaction with lay followers of the Buddhist faith, he also upheld a learned correspondence with the monk Kumarajiva. In the year 402 he organized a group of monks and lay people into a Mahayana sect known as Pure Land Buddhism, the Pure Land being the western paradise of the buddha Amitabha. In the year 404, Huiyuan wrote a treatise On Why Monks Do Not Bow Down Before Kings (沙門不敬王者論). This book symbolized his efforts to assert the political independence of Buddhist clergy from the courts of monarchic rulers. At the same time, it was a religious and political text that aimed to convince monarchs and Confucian-minded ministers of state that followers of Buddhism were ultimately not subversive. He argued that Buddhists could make good subjects in a kingdom due to their beliefs in retribution of karma and the desire to be reborn in paradise. Despite the Buddhists' reputation of leaving their family behind for a monastic life, Huiyuan stated "those who rejoice in the Way of the Buddha invariably first serve their parents and obey their lords." 1 2 Ebrey, Cambridge Illustrated History of China, 97. ↑ For a translation, see Leon Hurvitz, " 'Render unto Caesar' in Early Chinese Buddhism," Sino-Indian Studies, V, 4 (Santininketan), 80-114. Ebrey, Patricia Buckley (1999). The Cambridge Illustrated History of China. Cambridge: Cambridge University Press. Zürcher, E. and Teiser, Stephen F. (2007). Buddhist Conquest of China : The Spread and Adaptation of Buddhism in Early Medieval China (3rd Edition). Boston, MA: Brill Academic Publishers, pp. 204–53.